"Ok" coming in pretty good here tonight at 01:22z 12/31/11. I thought this one had gone bye along time ago. I've been copying it every night for at least a week now in east central Illinios. Lots of QSB on signal sometimes but still copyable. I have NOT been able to hear any of the beacons around 4080 kHz +- yet this winter. I'm hearing OK at 0118utc...here in Pine Colorado. SX 190 and 1/2wave end fed wire for 40mtr with tuner. Sure is good to hear it back on the air. put out anymore pirate beacons. But I sure like to listen to them. GF law and order all the time now...I put my guns away so to speak. Making it into Colorado 0217 Z - Not strong, but beating out the S-7 noise here. Can clearly copying "OK". Yeah, I thought this one was a goner too, for some reason.... Glad to hear it! At around 0405Utc there was a dasher sharing OK freq. It was s4 on my R4B. I haven't heard it lately (at least over the last month). Is it still active? I wonder what part of the country it is living in these days? Nice signal here too at 0720Z. Frequency 3449.83. I thought I saw somewhere that it's in Arkansas? 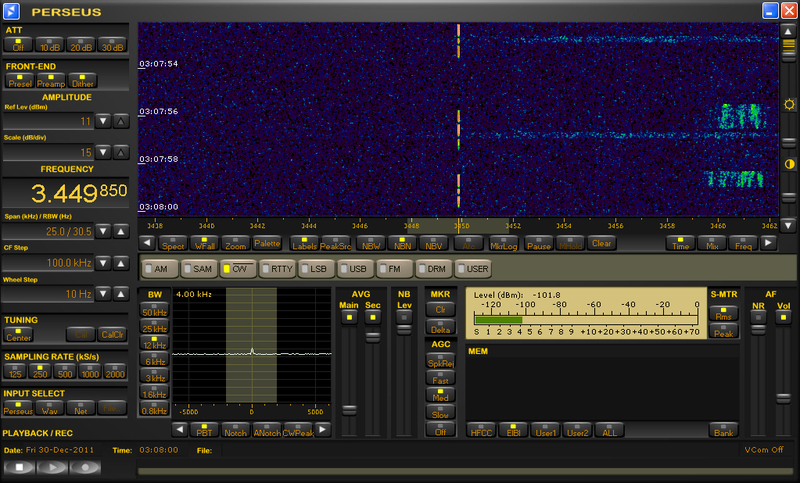 Nice signal tonight at 0400Utc.. Here also, but currently weak and just above the noise. Very weak here tonight. Hardly above the noise level which is low tonight. The loop is hearing it better. Green what is your general location?